No politicians attended our event, although a number were invited. This year it rained but it did not dampen the spirit of our volunteers or attendees. A recycling box giveaway by our regional government drove traffic to our event. Some displays could not be set up due to the rain. We will take away plenty of good feedback to enable us to plan an even better event in 2017! 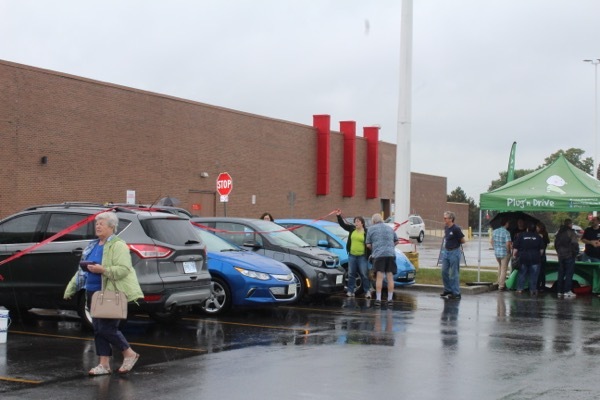 The Waterloo Region Electric Vehicle Association (@WREVAG), the Waterloo Region Voltec Group (@WRVoltec) and Charge Waterloo Region (@ChargeWR) proudly present a National Drive Electric Week 2106 Event! General Public welcome! We also encourage EV Owners to bring non EV owners so they may test drive the latest EV's available. Your questions about current EV models, purchase/operating costs, provincial rebates/incentives and local/provincial charging infrastructure within the Waterloo Region and beyond can be answered at NDEW 2016 Waterloo. Many static displays of electric vehicles will be on hand for all to see. Don't miss this event, sign up today! Registered attendees report 157,500 electric miles driven.